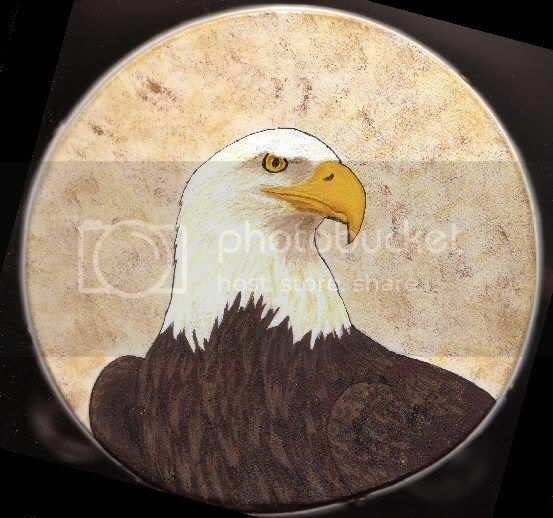 A few months ago, my grandfather asked me to paint an eagle on a cheap tamborine he picked up at the second-hand store. I kept meaning to start it, but first I had to get the right paints... then I had to track down a good reference... then I had to read up on color theory... then (fill in the vaguely art-related excuse for not sitting down, shutting up, and doing it.) The past few weeks, Grandpa hasn't been quite himself all the time. He is, after all, 88, but he's been fairly sharp and active, until a recent fall let his age start catching up with him. Somewhere in the back of my mind, I knew I'd never forgive myself if I didn't finish the eagle drum before he went away, be it to the grave or the shadowy mists of his own mind. So, yesterday, I dusted off my workbench, dug out my paints, printed out a royalty-free ref image from Corbis, and started painting. In the space of a few hours, I did what I hadn't done in months and months: finished something. The above picture, scanned in with my recently-reconnected scanner, is the result. Considering that it's been years since I even attempted remotely realistic acrylic painting on any surface, I'm fairly pleased with how it came out. As I sat there at my workbench, carefully picking and mixing colors, listening to the ambient noise of the local classical station in my headphones, I realized how much I missed the simple act of creating something. I looked around the workbench at all the things I've accumulated for "someday" projects: the pyrography equipment, the wire and foil and accessories for polymer/Paperclay sculptures, the brushes and paints, the pens and pencils. Is it really so difficult, I asked myself, to find an hour - or even half an hour - every day or so to come down here and Do Something? Is it any more difficult to find the same time to Do Something on my computer, to dust off the tablet for Paint Shop Pro, work on site expansions in FrontPage, or write a few pages in Word? I've been going through Bryce 5.5 slowly, with the help of a great online tutorial link I found after I broke down and registered for the official Bryce forum, but mostly I've been poking around, memorizing controls and staring at pretty buttons or presets. I also recently got the go-ahead to start the logo for one of the day camps I design annual logos for. (The other one just got their committee together and hasn't decided on a theme; the camp's in early July, and this is May.) Though they have a fairly specific idea of what they want, and it will therefore take minimal efforts on my part to come up with the design (one of my usual hang-ups), I still find myself holding back. Last year, I had the logo for this camp pretty much done by this time. This year, I haven't even started any serious sketches. There are reasons, of course - there always are. Last year I didn't have a job. Last year I wasn't breaking in a new computer. Last year I had a bit more lead time. Last year the sky was a quarter of a shade more blue. I know the bottom line, of course: I'm still afraid to screw up, so I just avoid starting things. And every day I avoid starting it is one less day to get it done. Time isn't just getting away from Grandpa. It's getting away from everyone, every day, whether we use it or not. I need to stop thinking in terms of whether the end result will be worth the time and effort. I need to remember what it's all really about: the joy of creation. And I need to start now.